Green Gas or CO2? Full metal or Plastic? Are $200 guns really that much better than $80 ones? We answer all these questions and more in our best airsoft pistol guide of 2018. In a Hurry? Check out my top 3 airsoft Pistols in the table below. Continue reading if you’re looking for in-depth reviews, budget options or target-practice springers! Verdict: The KJW M9 is the best airsoft pistol for most players! Extremely affordable, laser accurate and impeccable craftsmanship; the pinnacle of airsoft handguns! Hiya! I’m Liam and YOU just found the very best airsoft pistol guide on the internet! No matter if you’re a resourceful beginner to the game searching for a trusty sidearm or a smart parent looking to buy a wicked birthday present for your kid; I’ll guide you along. Whether you’re looking for top notch GBB pistols, C02 or Green Gas, cheaper budget gas pistols or are leaning more towards backyard-play spring pistols – this guide has it all! The KJW M9 – my #1 choice and the best airsoft pistol I can recommend for beginner airsoft players. A highly realistic feel, manufactured to perfection with impeccable performance in both indoor CQB and outdoor field scenarios. Compatible with both green gas and CO2 and with many many readily available upgrade parts and customization options, the M9 proudly heads my ranking of the best airsoft pistols in the world! Check out this great video review of the KJW M9 by USAirsoft. Manufactured by one of my favourite companies, the 31-year-old Taiwanese airsoft legend Kuan Ju Works, the KJW M9 is an all black, full metal, double action gas blowback pistol. Dimensions are 8.5″ long by 5.25″ tall with a barrel length of 5″ and a real-gun-feel weight of 1.9lbs. Depending on outside conditions, with green gas, the M9 shoots at around 320FPS. If used with a C02 mag, expect both FPS and recoil to increase. The KJW M9 features an ambidextrous on-frame safety (perfect for lefties), non-ambidextrous magazine release, a serrated metal slide white dot iron sights and an adjustable hop-up. The only plastic part on the pistol is the checkered grip which fits your hand as if it was custom-made for you. There are also many reinforced steel parts throughout pistol. Some milsim fans may be disappointed to find no trademarks other than a personalized serial number and two KJW logos on the grip. When it comes to build quality, this GBB impresses effortlessly. The full metal body and a high degree of manufacturing proficiency by KJW have given the gun an incredibly realistic feel and intuitive handling. The blowback and recoil echo this as well. Fitting perfectly in your hand, the M9 offers a very responsive trigger and a smooth double action mechanism. The slide, hammer and slide catch operate smoothly and without issue or signs of early wear and tear. When it comes to construction and craftsmanship, KJW has excelled in all aspects. The ultra-realistic feel mimics that of a real world M9 as perfectly as physically possible. An impressive and very satisfying achievement. The only incy wincy drawback many (me included) have noted with the gun is the non-threaded spray on the orange tip that KJW adds to the US version of the pistol. This means you can neither use a silencer nor remove the orange tip for milsim purposes. Fortunately you can easily mitigate this issue by buying an all-black threaded aftermarket barrel. Did you know? With sprayed on orange barrel tips, an easy workaround for increased realism is to wrap black tape around the tip, concealing it. An easy, cheap and quick fix! Field stripping the gun is easy and straightforward. Remove the magazine, hold down a button, flip a switch and remove the slide. From there you have full access to all your parts as well as the hop-up. The hop-up itself is accessed on your slide, via an Allen wrench that comes with your gun. Detailed instructions are provided in your gun manual (which you can also view here). Moving on to functionality and performance, the M9 fares extremely well at both CQB and outdoor fields. Achieving FPS measurements of 320FPS and up to 370FPS with CO2, the M9’s effective range is up to 130 feet (in good conditions, upgraded parts and perfectly adjusted hop-up). It’s an incredibly accurate pistol and achieves as great a range as you’ll ever need from a secondary. The recoil and blowback provide a very loud (as BB pistols go), snappy and satisfying kick when shooting. With GBB magazines costing around $40 a pop, I would recommend you to go with a green gas one instead. Personally, I always like to have one (outdoors) or two (CQB) additional pistol magazines on me. Purchasing at least one additional magazine is always recommended. Not only for increased performance on the field, but also in case your first one starts leaking or has other issues. The gun comes in a high-quality box in which you’ll find, beside the pistol, a small box of BBs (which I always advise to promptly throw away :), read why below), a gas magazine and a speedloader. If you prefer to use CO2 with your gun, you’ll have to buy a specific magazine which is not included. The speedloader is nothing to write home about, then again – I’m not one to complain about 99 cent speedloaders. The BBs included with your purchase are often low quality 0.12g or 0.20g pellets. Always make sure to use high quality BBs with your airsoft guns! Did you know? Using the highest quality BBs possible is very important for achieving maximum accuracy and range. Fortunately I have you covered in my best airsoft BBs buying guide! The KJW M9 is an all-around star and one of my all-time favourite airsoft pistols. A no-brainer buy, guaranteed to offer hundreds of fun filled hours! Modeled after the Glock series, the KWA ATP is my first runner up for the best airsoft handgun. Sleek, minimalist and beautiful. Manufactured extremely well, making effective use of both the look and versatility of a metal-plastic combination. Showing of impressive range and accuracy readings, the pistol is perfectly suited for CQB and conventional outdoor field play. Check out this great video review of the KWA ATP. 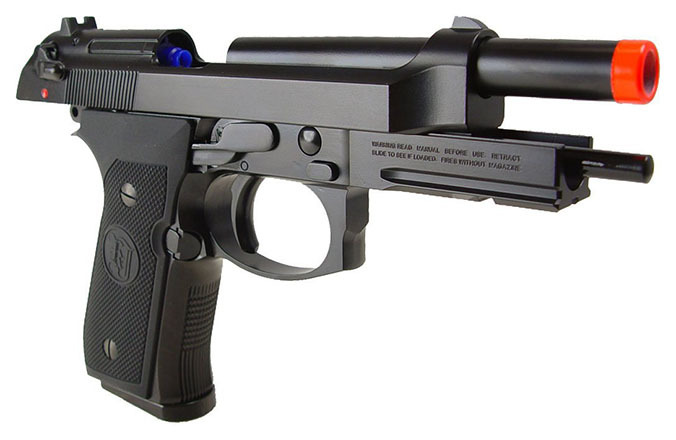 The KWA ATP is an all black, single action gas blowback pistol with a metal slide and plastic body. Dimensions are 8″ long by 5.75″ tall with a barrel length of 4″ weighing in at a light 1.6lbs. The KWA ATP is built to utilize green gas only with which it achieves, depending on conditions, performance readings of up to 340FPS. Manufactured by KWA USA, a California based company, the ATP has been a longtime favourite among airsoft players. The minimalist pistol does not boast with many features as much as it does with a clean design and awesome performance. The few features it does include are an interchangeable backstrap on the grip, a fin trigger safety and the ability to fit into all Glock holsters; as you would expect from a pistol based on the Glock series. The ATP (Adaptive Training Pistol) is fitted with the standard 3 dot sight, which appear crisp and align well. Depending on the specific gun you purchase your ATP may or may not have a threaded orange or black tip. Unfortunately, airsofters have reported that very few mock suppressors are able to be installed on this pistol. Players who enjoy the appearance and feel of a full metal pistol yet appreciate the versatility and light weight of a polymer body will find the perfect compromise with the ATP. The strong and durable yet lightweight character of KWA’s pistol gives you best of both worlds; realism and performance. Due to legal restrictions from Glock, the ATP bears no replica markings whatsoever. While milsim-ers may be disappointed, this adds to the clean and polished look of the gun. The only marking you’ll find is a faint “Adaptive Training Pistol” imprinted into the metal slide as well as a serial number. Right out of the box, the ATP may feel “dusty” and in need of a good cleaning and generous lubrication. This is not entirely uncommon, however. The ATP uses the famous drop-in Glock trigger; a safety lever integrated right into the middle of the plastic trigger. This inhibits any and all incidental discharges from happening by requiring your whole finger to exert the force on both the trigger and the safety fin at the same time. As for the trigger mechanism itself, the pull is light and intuitive. Moving on to performance, let’s take a look at accuracy, range and FPS. As mentioned above, the pistol shoots at around 330-340 FPS. One interesting and unusual observation I have is that the deviation shot to shot seems larger than usual with this gun. While normal GBB may deviate +-5 FPS, when chronohraphed, the ATP had deviations of up to 20 FPS. Deviation in terms of FPS isn’t that big of deal with a pistol, so let’s look at accuracy. The ATP performs very well here. Both in my opinion and those of my airsoft buddies, the ATP is among the top 5% in accuracy. There has, however, been accuracy issues due to the misbehaving sights. They are not screwed in and are only held in place by friction. This is obviously sub-optimal as it will throw off your aim during heated combat. Fortunately this issue is easily fixable with some adhesive. When it comes to range, the pistol performs much like the KJW M9. Ranges of up to 110 feet are no problems for this little dude, with 130 being the max effective range in perfect conditions. The hop up does a marvelous job at providing a stable flight trajectory and thus enabling such impressive ranges. No need to mince words with the propellant – green gas and green gas only. Anything else will void the warranty, including pure propane. ATP’s magazine is metal and designed to look as similar as one a real Glock would use. It comes with sliding rubber bumper at its bottom, to protect it from drops and falls. The loading process is very easy due to the magazine’s locking future. As before, I will always recommend you to carry at minimum two magazines. Fortunately, additional ATP magazines are readily available and at the same price as both KJW’s M9 and Tokyo Marui’s 5.1. The gun benefits of KWA’s solidly built and reliable hop-up. One major advantage of the ATP is the ability to precisely and accurate dial in a desired setting with the clicking hop-up system. No more guessing, no more readjusting. A very high quality, the reliable hop-up system resulting in high-end performance! 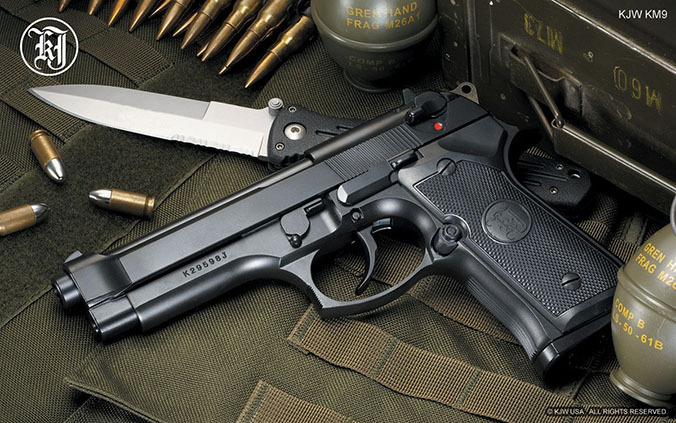 The ATP is a beautiful, sleek, well performing and well-built airsoft pistol, worthy to be in any players arsenal. 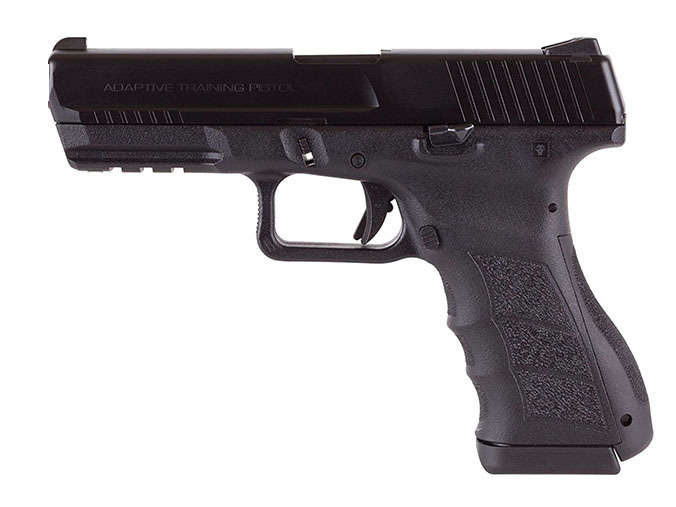 If you’re a fan of Glock, the ATP is the perfect sidearm for you! The Tokyo Marui Hi-CAPA (High CAPAcity) 5.1 is an all black all plastic single action blowback pistol. Dimensions are 8.75″ in length with an inner barrel length of 4.7″ and weighing in at about 1.9lbs with an empty mag. You can expect the pistol to shoot at approximately 280 FPS, up to 290; your mileage may vary. The TM Hi Capa runs on green gas only. 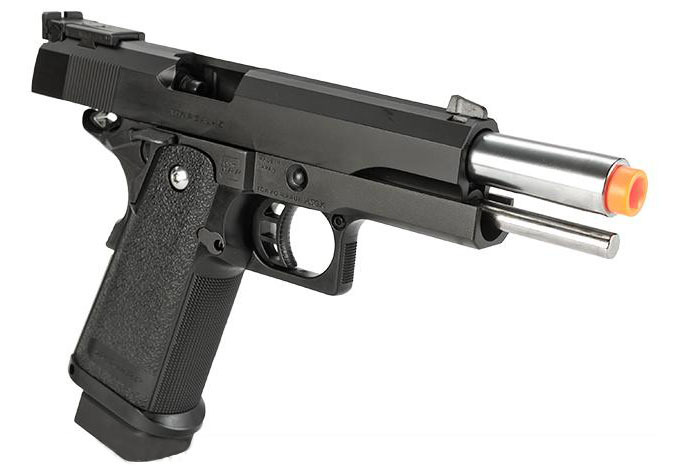 Check out this great video review of the TM Hi-Capa 5.1 from airKBG. Built by one of the first ever and most respected airsoft manufacturers – Tokyo Marui, the 5.1’s body is all plastic with some metal parts. Specifically the hammer, safeties, mag and slide releases, sights, hop-up. As the name suggests, the magazine carries a full 30% more BBs than standard GBB pistols. As such, the magazine protrudes about an inch from the bottom. The 5.1 has both an ambidextrous on-frame safety and a beavertail safety. The gun is covered in Tokyo Marui trademarks, logos and other tidbits in an effort to make it looks more realistic. When it comes to craftsmanship, there is room for improvement. Then again you don’t buy a TM 5.1 for milsim purposes. You don’t buy a TM if you’re all about metal. You don’t buy a TM if you’re on a budget. You buy it because it’s the single best blowback airsoft pistol for your buck. Let me make this as clear as I can. The Tokyo Marui 5.1 Hi-CAPA will quite possibly be the single best airsoft purchase you can make. The reason airsoft players are quick to spend so much money and deal with all the baby-sitting this pistol requires is the pure performance dominance that it exerts on its competitors. The trigger pull is really short, aiding in a quick unload. The recoil is crisp and satisfying. While the gun is made for duster gas, if used with green gas it becomes a pure force of nature, loud and truly scary pistol to fight against. The plastic side, albeit temporarily, aids in a very quick cycle and good gas efficiency. Here is the true MVP – the famous Tokyo Marui hop-up. The Japanese manufacturer has a proprietary hop-up mechanism that is as close to “set and forget” as it gets. After some initial adjustments, the hop-up performs like a well-oiled machine and provides consistent flight trajectories not pellet to pellet but month to month. Putting on the perfect amount of spin to the pellet is the main reasons for TM’s phenomenal range and accuracy measurements. When I say phenomenal, I mean it. TM 5.1’s effective range can be twice that of other GBBs. People have reported effective ranges of up to 200 feet! A pistol, shooting accurately at 200 feet! Another big advantage of Tokyo Marui’s 5.1 is the huge aftermarket on parts. Really, the pistol shines due to the sheer amount of freedom to upgrade and shape it according to your wants and needs. Unfortunately, I can’t state this without introducing some one of the biggest drawbacks of the Tokyo Marui; the outright need for upgrades. The two main reasons that Tokyo Marui’s 5.1 isn’t my #1 recommendation is due to the price and the eventual necessity to upgrade and replace parts of the gun. Sure, the over-the-top grip texture that digs into your hand and leaves callouses after a day of play can be overlooked. The back iron sights without dots, though cumbersome, aren’t deal breakers. Finding a holster that fits is an ordeal. Oh, and did I mention that this gun is only sold in a couple of places online and Tokyo Marui is constantly battling import laws? That’s all fine and dandy – easily overshadowed by the sheer performance of the gun. The major problem, however, is the plastic slide. With heavy use you will have to be replaced sooner or later. And replacing it, my dear friend, is expensive. Once the plastic slide cracks with heavy use, at around the 6-month mark, you will have to shell out around $80 for an all new metal slide. If you’re out of luck, you’ll further need to purchase and adapt parts to fit your new slide. With a stock price of $150, we are at $230 after 6 months of use. That is twice as much as the KJW M9! For that price, you could buy an awesome AEG instead! Due to the plastic body of the pistol, it’s made to be used with duster gas. Green gas can be used instead and is my recommendation. Green gas will put much more pressure on the gun and yes, will be problematic for the plastic slide. Here’s my rational – the slide will break anyway. Might as well get as much power out of your gun as possible. Additionally, duster gas is not readily available everywhere and requires you to shell out yet again to purchase an adapter with which to fill your magazines. More headaches yet again. Speaking of magazines, it’s pretty straightforward here. Due to utilizing green/duster gas exclusively and CO2 not being a possibility, Tokyo Marui has only one type of Hi Capa magazine they offer at a similar price as any other. As usual, I will recommend you to purchase at least one more magazine in addition to your stock purchase. With that additional magazine, the duster gas and its adapter we have reached a price tag of $300 for a pistol. Perhaps the best pistol ever made, but only a pistol nonetheless. With your gun purchase and inside your box (which will be covered with black tape, due to aforementioned importing issues) you will find the following: a Japanese (yes) gun manual, a 20mm Picatinny rail to set you up for some entry upgrades, a few dozen BBs (to be thrown away, you don’t want to use those), one 31rd magazine as well as a cleaning/unjamming rod. While an amazing purchase for most advanced airsoft players, beginners would be well advised to go with a more forgiving gun. One that’s easier to handle and won’t set your wallet on fire. Still, remember the name Tokyo Marui and once you feel confident in your airsoft game and are looking to step it up – the 5.1 Hi Capa is the only viable option for you. 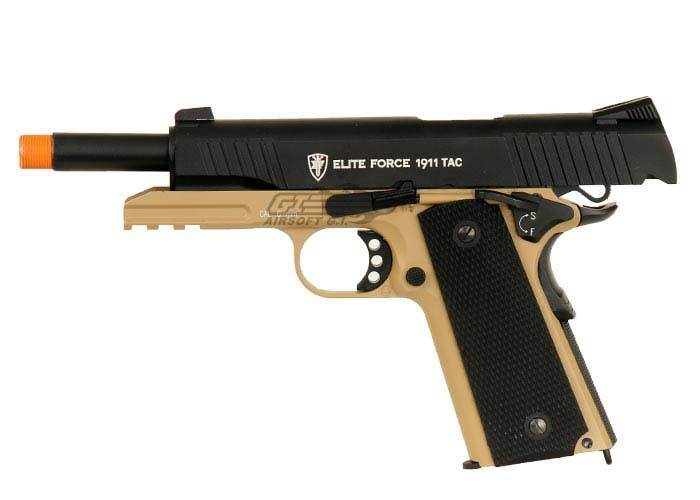 The new Umarex Elite Force 1911 TAC (Gen3) is a solid mid-level gas blowback airsoft pistol. 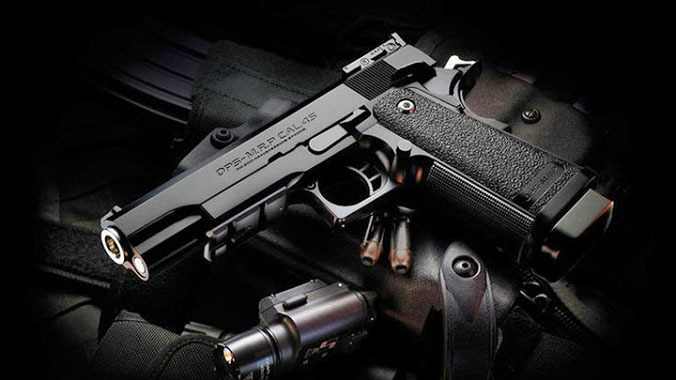 This gun is based on the tactical version of the classic 1911A1 design. 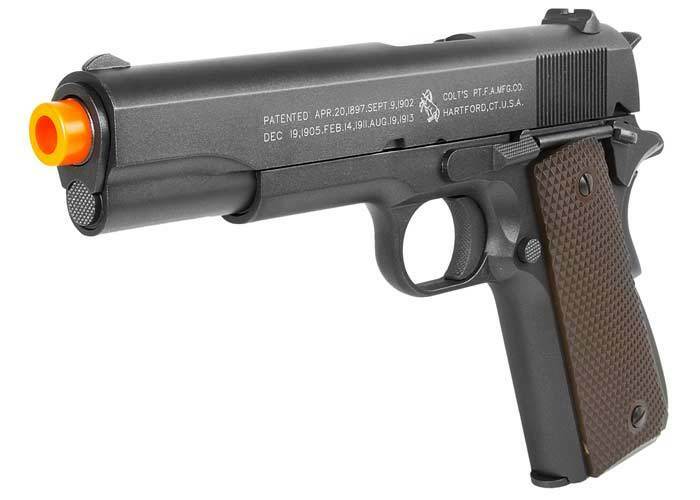 This 1911 is powered by C02 and offers high power levels and consistent performance. The price point on the gun places it just under the $130 mark. 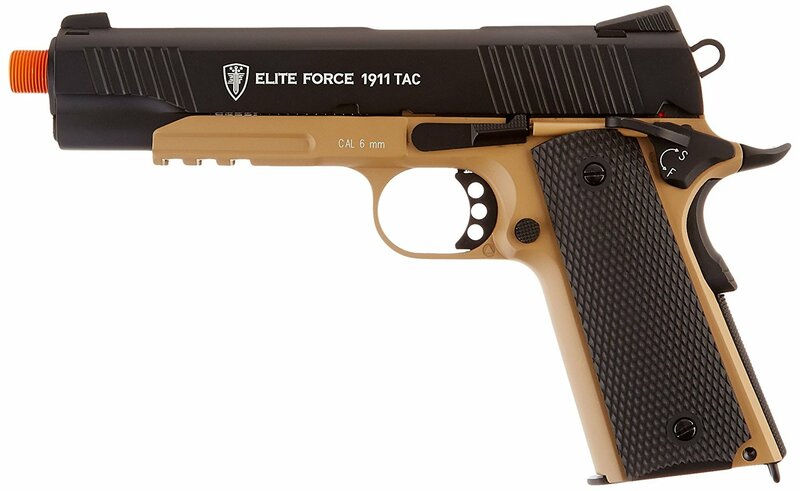 Check out this great video review of the Elite Force 1911 by OddysAirsoft. 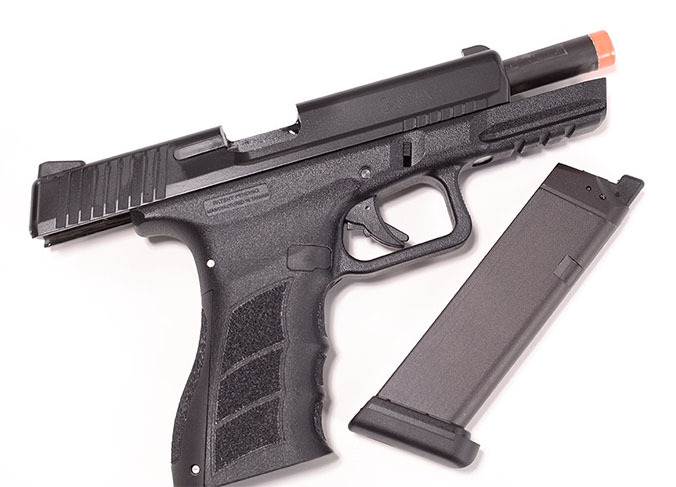 Umarex offers full trademarks for this pistol and it appears to be OEM’d by KWC. The gun shares many similarities with the Redwolf Airsoft brand of pistols. Full metal construction makes this a solid, rattles free sidearm. Tactical grips, front and rear sights, ambidextrous safety, skeleton trigger, skeleton hammer, slide serrations and a 20mm Picatinny underside rail make this 1911 stand out from the classic design. 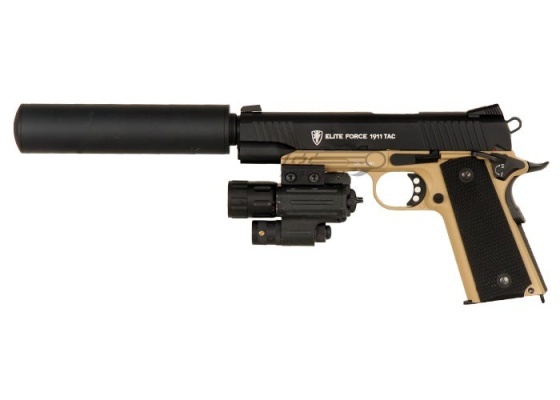 The Elite Force 1911 is powered by C02 which means a reduced loading capacity for BB ammunition, the magazine holds 14 BB’s (+1 in the chamber) and a single C02 bulb. FPS output is around the 345 FPS mark using 0.2g BB’s. The gun has a solid range and good accuracy so top marks on the hop-up and barrel design. The barrel tip is threaded so is happy to accept aftermarket silencers for increased barrel length (improved power and performance) and tactical feel. Shooting feel is fantastic, with the heavy metal slide slamming back and forth into battery it sends positive shocks down your arms. The recoil is so intense good pistol shooting discipline is required to stay on target during rapid fire. 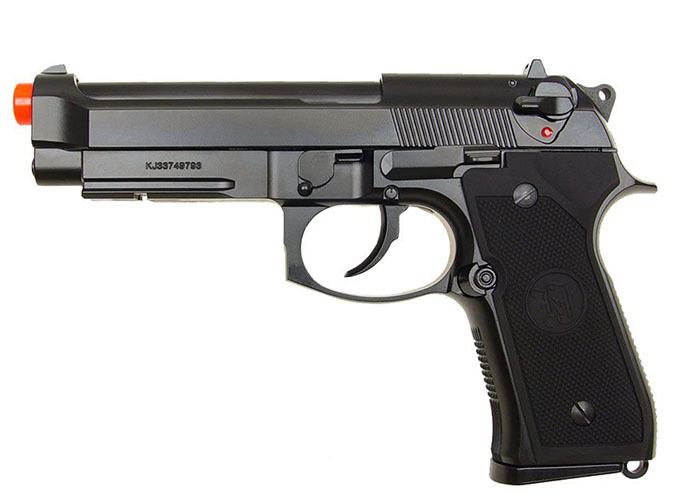 Overall this is a great looking airsoft pistol with high-quality build materials and excellent ergonomics. The gun shoots with good power, range and accuracy and shooting feel is excellent. The only markdowns I can think of are the limited ammunition capacity, Umarex warning marks and slightly squishy trigger feel. Otherwise, this is a great candidate for your pistol collection. With so many airsoft pistols to choose from and a such a wide variety of real-world guns to replicate I’d like to offer you some additional options. While they may not perform as flawlessly as my top 3 choices or may lack in other departments, the following three guns are a good, solid choice for your airsoft handgun needs! The Colt 100th Anniversary M1911 A1 is an AMAZINGLY priced fully licensed 1:1 scale authentic full metal, single action blowback 1911 airsoft pistol replica manufactured by KWC, sold by Cybergun and fully licensed by Colt. Dimensions are 8.85” in length by 5.5” in height with a weight of 2.15lbs. This 1911 shoots between 340 and 380 FPS and uses exclusively CO2 as its propellant. Despite its cheap price, the Colt manages to impress with a full metal body and slide, both on-frame and beavertail safeties and an amazingly accurate 1:1 design and beautiful finish. It sports large laser etched Colt trademarks, just like the original. 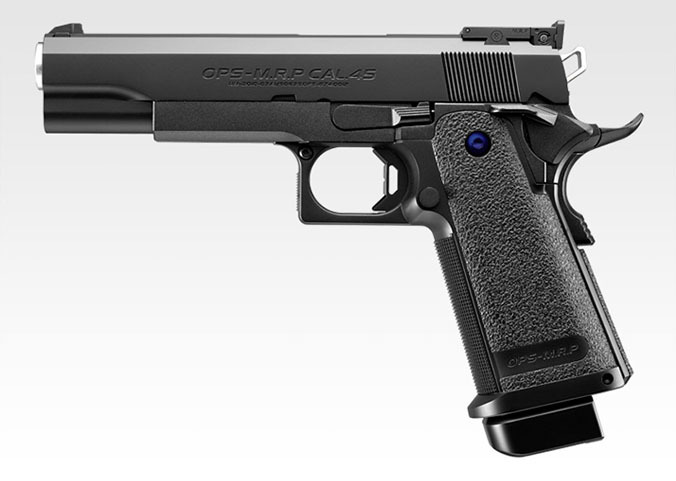 Often touted as the best CO2 airsoft pistol, the M1911 is truly an exact replica, bells and whistles. The only minor drawback when it comes to craftsmanship is that the metal scratches easily. Some players actually appreciate that fact as it gives the pistol an even more realistic look and feel. As for performance, the gun kicks like a mule. It’s a powerful pistol, and going with the top end 344 FPS version, you’ll be greeted with awesome recoil and blowback. The C02 provides this gun with an immense FPS output. As for accuracy and range, it’s good but not great. Perfectly suitable for CQB, but not my #1 choice for outdoor condition combat. Due to the super strong FPS measurements, I will recommend you to use this gun with a 0.25g BB to achieve better accuracy and and range. The M1911 is to be used with CO2 exclusively. The CO2 magazines are high-quality and full metal. Unfortunately, they only hold 17 BBs and due to a very stiff spring and tight feeding grove, speedloading is basically impossible. One CO2 cartridge will provide you with around 60 shots or 4 full magazines worth of BBs. All in all, the Colt M1911 is an incredibly well built, super affordable airsoft pistol that will make any milsimer swoon over its perfect craftsmanship and realistic built. Kicking like a mule on steroids, this CO2 pistol will deliver hours upon hours of fun in CQB skirmishes or in your pistol collection. The ASG CZ P-09 is a BIG double action gas blowback pistol with a metal slide and polymer plastic frame manufactured by KJW under full license and after the original technical drawings by CZ and sold by ASG. The dimensions are as follows: 8.5” in length by 5.8” in height with a weight of 2.0lbs flat. Due to being compatible with both green gas and CO2 magazines, the P-09 will shoot anywhere from 320 to 380 FPS. USAirsoft unboxing and review of the ASG CA P-09 review. The CZ P-09 comes with a spacious integrated mountable rail, 3-dot sight system, authentic CZ marking, ambidextrous on-frame safeties as well as aggressive (perhaps overly) texturing on the frame and grip. Due to being designed by the original drawings, it achieves an incredibly realistic look and feel. Though a big handgun, the ergonomics and grip are superb and the pistol feels perfect in my medium sized hands. The polymer frame matches and blends in well with the metal slide, adding to the amazing look of the pistol. The backstrap can be switched out as well, although no extra come with your purchase. Moving on to performance, the ASG CZ P-09 provides very crisp blowback and recoil and a consistent shot with which is achieves ranges of up to 120ft. At ranges below 100 feet, you can expect to hit your target all day, shot for shot. When utilized with the green gas magazines it comes with, you should expect your gun to put out around 320-340 FPS. If you decide to buy an aftermarket CO2 magazine you will be able to boost these readings to up to 380! The trigger pull is incredibly intuitive smooth and light, even if a bit longer than usual. Both the CO2 and green gas magazines are metal and hold 25 rounds each. Both are, just like the P-09, fully licensed by CZ and have the appropriate trademarkings. In general, expect to the green gas magazine to provide around 1.5 magazines worth of shots per fillup and the CO2 mag about twice as much. 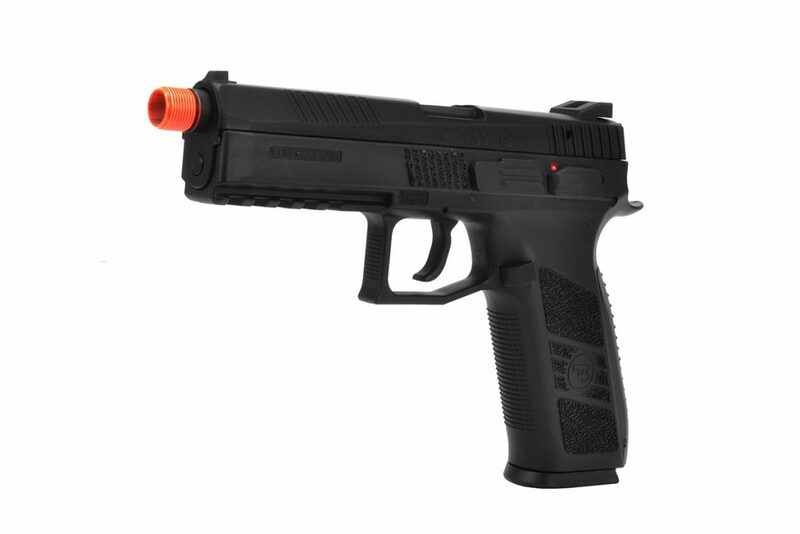 KJW, the original manufacturer of the CZ P-09, have outdone themselves with yet another awesome GBB airsoft pistol. The P-09 is a big, bold and beautiful piece of weaponry. Crafted very well and performing like a top 5 pistol, offering both GBB and CO2 compatibility; it will fit might fine into any hobbyists armory! My first ever airsoft pistol, the KJW Sig Sauer P226 is a double action gas, full metal gas blowback pistol manufactured by KJW and licensed by Sig Sauer. The dimensions read 7.8″ in length, 5.75″ in height and a weight of around 2.1lbs. The KJW P226 runs on green grass and achieves an FPS output of around 300. Redwolf Airsoft compare the KJW P226 against it’s rivals in this excellent video. The P226 is a brutishly big, solid airsoft gun which features fully licensed Sig Sauer engraved markings, a 20mm frame accessory rail, a rear adjustable 3 dot sight system, decocker, a nicely textured grip, rear slide serrations and an incredible fit and finishing. The trigger pull can be a bit long and cumbersome. The gun is one of the most solid pistols I have ever used, it feels heavy and durable and intimidating. The grip does a very good job at giving you control over this beast, though it may be just a smidge too thick for some shooters. There is a decocker placed about an inch above the mag release, though manual decocking is possible as well. If you’re looking for an awesomely built CQB gun, the Sig Sauer will be a very good choice. For anything outdoor related/longer distance shooting I can’t honestly recommend this pistol. When it comes to performance, there is something to be said. It simply can’t compete with KJW’s M9 or Tokyo Marui. While ranges of up to 100 are doable with a well-adjusted hop-up, targets at longer ranges will be difficult to hit. 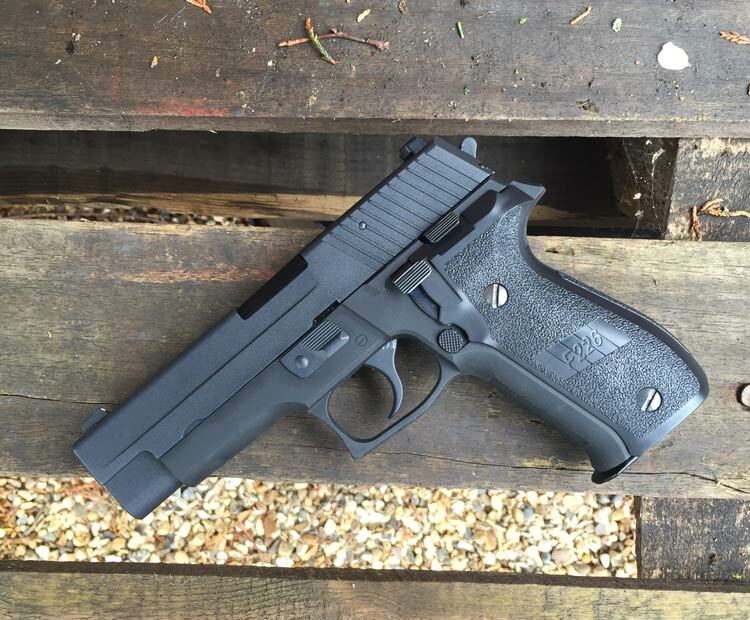 Additionally, contrary to first impressions, the P226 is a fairly tame beast. Shooting at an average of 300 FPS, it certainly isn’t a powerhouse in terms of power output. The green gas magazine included is metal and holds 26BBs. You can expect to get around 35-40 shots per fill-up. I’ve had issues with my original magazine where it started leaking about a week or two after use. Make SURE not to overfill it to avoid this issue. As soon as you feel resistance – stop. 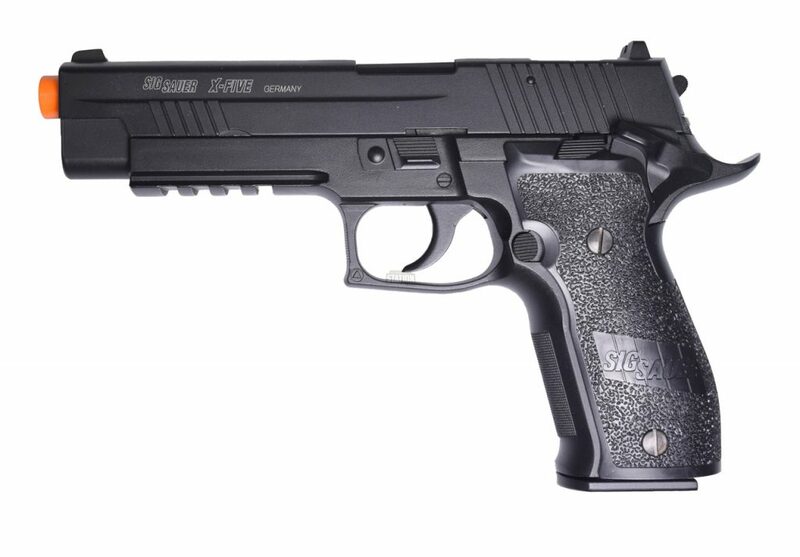 The KJW Sig Sauer P226 is an incredibly looking GBB pistol. It will hold its own on any CQB skirmish, backyard playing session or as a collectors item. Still, one of the best crafted and most durable airsoft pistols you’re likely to find.